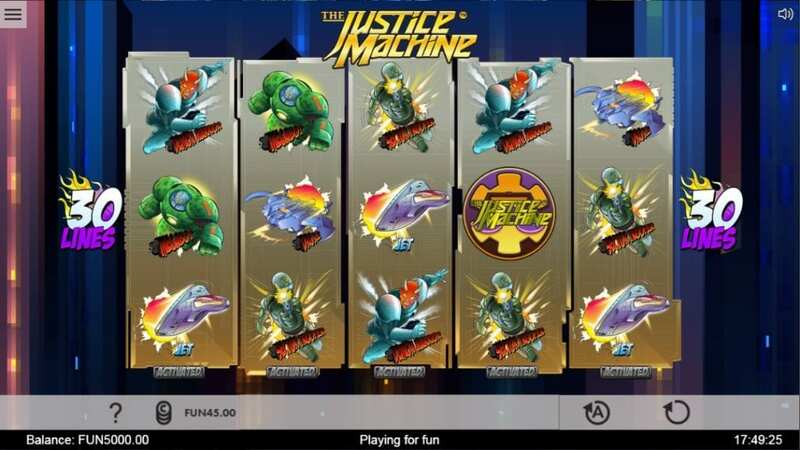 Based on a group of fictional superheroes, Justice Machine is an action-packed slot created by 1X2 Gaming. You can team up with members of the Justice Team to defeat an array of villains on your way to collecting cash prizes. 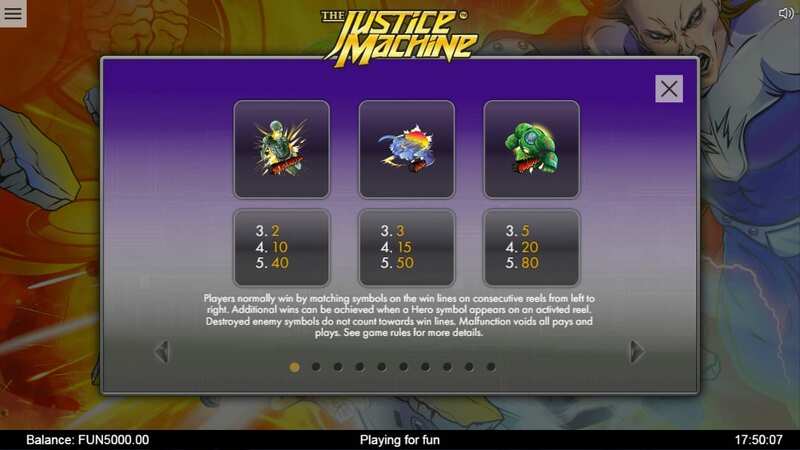 Justice Machine is a 5-reel slot with 30 pay-lines to activate at once. The unique thing about this slot is that each individual character symbol comes with an in-game bonus. You’ve also got Wilds, a Free Spins Feature and the Justice Machine Battle Bonus to look out for. Join forces with the Justice Team today. Play the latest online UK slots today. For many people, especially who were born in the 1980’s and 1990’s, Justice Machine is their favourite fictional superheroes. Throughout the gameboard are a variety of characters and superheroes from the popular comic book. A guide is provided to help players to select the best video slots online with amazing graphics! The low and medium value symbols that will make up the majority of your winning combinations are: Megabot, Drone, Sector Trooper, The Justice Machine logo, Jet and Demon Warrior. The fun starts when the superhero symbols come into play, which are: Talisman, Blazer, Chain and Demon. These characters are higher paying symbols and also provide a special individual bonus. TALISMAN – Talisman’s power triggers a random cash prize. BLAZER – Blazer eliminates enemy symbols and replaces them with fireballs, for cash prizes. CHAIN – Chain eliminates enemy symbols and replaces them with lightning bolts, for cash prizes. DEMON – Demon awards a win spin. TITAN – Titan is WILD but can also expand to fill an entire reel once his power is activated. CHALLENGER FREE SPINS – The FREE SPINS will trigger when Challenger’s power activates. You’ll receive 10 free spins. JUSTICE MACHINE BATTLE BONUS – To activate this BONUS, Diviner has to land in the Power Activated reel. Upon doing so, the BONUS will trigger and you’ll be moved to a new window. You’ll then have to choose an individual hero who will battle with an enemy and if they win, you’ll receive a random multiplier. This will continue until all enemies are destroyed and as a result, your winning multipliers will merge and be applied to your initial stake. Justice Machine certainly isn’t your run of the mill slot, but it’s comic book design and special characters make your playing experience worthwhile. You won’t be waiting around for a winning spin as the individual character bonuses constantly trigger.